So what do you make of this? It’s billed as the world’s first comprehensive nutrition system for infants and toddlers and no, it’s not a breast. It’s the Nestlé Babynes, and if it looks familiar it’s because it’s based on the company’s Nespresso coffee pod machine. 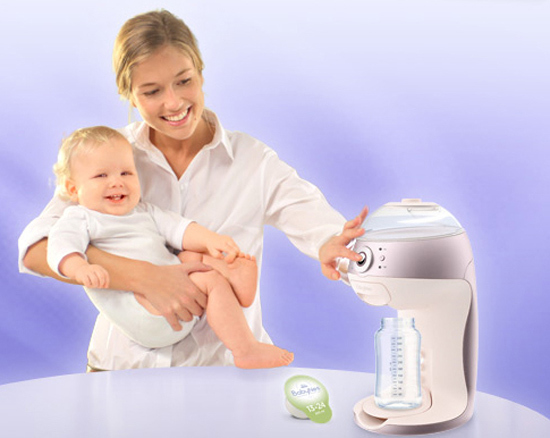 Pop in a capsule, press a button and thirty seconds later, you have not a steaming cup of coffee but a warm bottle of baby formula. It’s yet another gadget for parents of babies and toddlers, but what do we really think of this new concept? The launch of BabyNes has caused some controversy among breastfeeding campaigners, who say Nestlé are violating the International Code of Marketing of Breastmilk Substitutes. Nestlé insist they support breastfeeding exclusively for the first six months á la WHO (World Heath Organisation) guidelines, and that their BabyNes is merely an alternative for those babies who are not breastfed. The machine has just been launched in Switzerland, where it costs 249 Swiss francs (about $280), plus another 50 francs ($55) per pack of twenty-six formula capsules. If it proves popular, it could soon go on sale across the globe. Can a machine discourage breastfeeding by making formula preparation so much easier? Personally, I don’t think any mother will see this and decide to give up breastfeeding but it could be a good option for those parents who for whatever reason are not breastfeeding. Watch the video of how it works (it’s in French but you’ll get the gist of it) and tell us what you think.